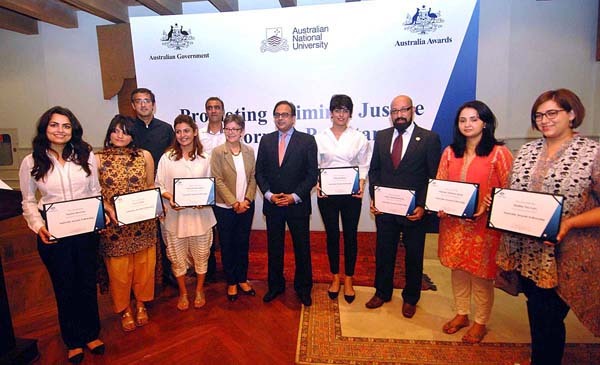 Margaret Adamson and Pakistan’s Attorney General, Ashtar Ausaf Ali Wednesday congratulated ten Australia Awards Fellows on the completion of their research on criminal justice reform in Pakistan. fellows on criminal justice issues including community-based dispute resolution, community legal empowerment, mental health and criminal justice, and abuse of anti-terrorism laws. trust they will continue to advocate for criminal justice reform with the aim of improving the efficiency and effectiveness of Pakistan’s criminal justice system and the rule of law, for the benefit of all citizens,” High Commissioner Adamson said. Canberra with funding from the Australia Awards Fellowship Programme. equip upcoming generations with the skills and knowledge they need to shape successful, inclusive and sustainable economic and social development. opportunity to deepen and broaden links with leaders and professionals throughout the world through short term study and professional development. the basic motive behind this effort was to help development of Pakistan by building capacity and linking the research to ensure that the policies are based on research. reformation and the area of research has to be made relevant to the country and its laws. The research in law is relevant to Pakistan as well as to Australia and to the world. work, misuse of terrorism laws has to be given due focus and the institutions be strengthened to make the laws effective. minorities including religious minorities in different countries, gender discrimination, the legal frame work and its reformation were highly vital for the people, the countries and the democracy itself. on the occasion appreciating the topics and discourse of the workshop said these subjects are grossly ignored. and compile them for the benefit of the legal fraternity and the authority in place so that the reformation in the law can be taken to its logivcal end. be shared at large to develop realization of the gravity of the issues in the existing legal frame work. go viral that would help improve the legal frame work and pave the way for their effective implementation.